If you were an assassin, who’s the first person you would kill? If you said notable pirates in 1715, Schick and “Assassin’s Creed IV: Black Flag” have your back. For its latest product offering, Schick has teamed up with “Assassin’s Creed IV: Black Flag” to produce the stealthiest men’s shaving gift pack ever created. It’s so stealthy that if you acquire it while playing Secret Santa, you will have no idea who gave it to you. There are several little things that make this gift pack completely #Badass. And as we learned from British rock band Bush, it’s the little things that kill, or in this case, get you that close shave you’ve been pining for, yearning for, and in some cases, burning for. Razor storage is tricky, just like life as a man. Throwing a blade into your favorite shaving bag between uses doesn’t seem optimal, especially if you’re traveling. Or, if you’re living an on-the-go lifestyle and need a quick “Spartan Shave” (a shave sans shaving cream) because you spent the night in a strange place and have a big presentation first thing in the morning with a huge financial investment firm and no time to shave properly. Schick cocked backed its head and said, “Ah, hell nah, son” when it created the Travel Cap that comes standard in the Assassin’s Creed Holiday Gift Pack. We hear all the time about lubricating strips that function similarly to a post-shave balm to eliminate razor burn or irritation. But how frequently do they live up to the hype? To quote Ice Cube on “When Will They Shoot?,” “Don’t believe the hype was said in ’88 by the great Chuck D/now they tryin’ tah f*** me.” The hydrating gel from Schick was so abundant that mid-shave I realized I wouldn’t need any post-shave balm. And I didn’t. The end. Think of the FlipTrimmer as the Optimus Prime component of the new Schick Hydro 5. Or, if you prefer an “Assassin’s Creed” reference, it’s similar to the way mild-mannered bartender Desmond Miles covers his true identity as the latest offspring in a long lineage of assassins who rely on their Animus to kill foes swiftly and efficiently. The reservoir tip flips back the way Optimus’ head flipped forward when he transformed from semi-truck to the Autobots alpha male to battle the evil Decepticons, which is similar to the way Desmond Miles uses the Animus to access hitherto inaccessible assassin skills. The FlipTrimmer transforms to a straight edge that allows you to precisely trim troublesome areas like sideburns and nostrils with ease. 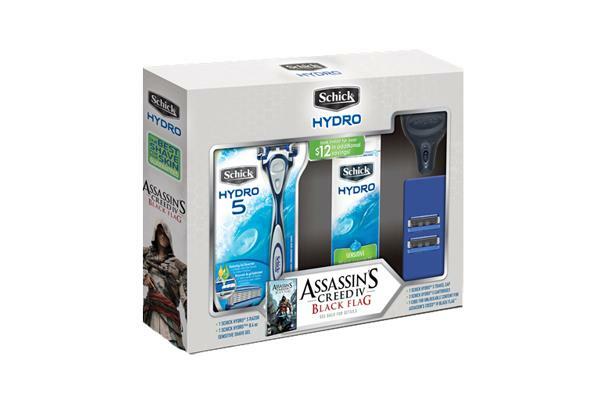 The Schick Hydro 5 Assassin’s Creed Gift pack is available ONLY at Target for just $9.99. Follow this link to order your gift pack. To post witty comments on the Schick Hydro Facebook page and Twitter feed, follow the links. And because we love our readers so much, we’re also giving away a copy of “Assassin’s Creed IV: Black Flag” for the PlayStation 3. Click here to enter for your chance to win!